Is that one of those tricky studio edits that doesn’t really represent the critic’s opinion? Um, no. Friedman’s online review was a rave. It began: "Filmmaker Michael Moore's brilliant and uplifting new documentary, ‘Sicko,’ deals with the failings of the U.S. healthcare system, both real and perceived. But this time around, the controversial documentarian seems to be letting the subject matter do the talking, and in the process shows a new maturity." Friedman added: "Unlike many of his previous films ('Roger and Me,' 'Bowling for Columbine,' 'Fahrenheit 9-11'), 'Sicko' works because in this one there are no confrontations. Moore smartly lets very articulate average Americans tell their personal horror stories at the hands of insurance companies. The film never talks down or baits the audience." Friedman even agreed with Moore that the film was not partisan – but the commercial has two jokey cuts mocking President Bush, including the old gaffe that OB-GYNS can't "practice their love with women" due to the liability problem. Mature? Nonpartisan? 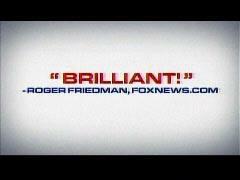 But Friedman also raved the last Moore film was "brilliant" at FOXNews.com: "It turns out to be a really brilliant piece of work, and a film that members of all political parties should see without fail. As much as some might try to marginalize this film as a screed against President George Bush, "F9/11" — as we saw last night — is a tribute to patriotism, to the American sense of duty — and at the same time a indictment of stupidity and avarice." He added it was a must-see: "But, really, in the end, not seeing 'F9/11' would be like allowing your First Amendment rights to be abrogated, no matter whether you're a Republican or a Democrat." UPDATE: Scott Whitlock e-mailed that Friedman had a similar rave for Al Gore's "An Inconvenient Truth" -- it's featured on the cover of the DVD, he says. The quote: "It doesn't matter whether you're a Republican or Democrat, liberal or conservative...your mind will be changed in a nanosecond."